Until recently, little was known of Dr. Samuel Campbell, the man who the Campbell River was named after. 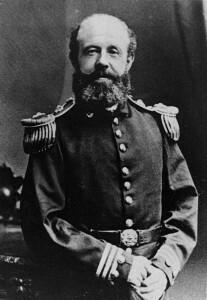 From 1857 to 18 63, Captain G.H. Richards and the crews of the ships Plumper and Hecate were surveying the Northwest Pacific coast. Dr. Samuel Campbell served as the Assistant Surgeon on both the Plumper and the Hecate. At the time there was a dispute between the British and the Americans about the location of the International Boundary. The 49th Parallel had been determined as the boundary, but once they reached the sea the course of the boundary line was unclear. No good charts of the area existed at the time. In such a vast region there were many features that the newcomers re-named in their charting process, and crew, friends, acquaintances, ships, animals and objects often found their names attached to bays, islands, mountains, inlets, and rivers. Dr. Campbell was born in 1832 in Glenleary, County Donegal in Ireland. Fifth born in a family of six, his family’s property went to his oldest brother, while he and his younger brother were encouraged to pursue a career in medicine. Samuel began his studies at the University of Glasgow in 1851, and graduated with a medical degree in 1856. Within six months he was appointed assistant surgeon on the Victory 101, and then shortly thereafter he was appointed to the H.M.S. Plumper. At this time the ship surgeon and assistant surgeon were also responsible for reporting on the natural history of the areas surveyed. In November 1857 the Plumper arrived at the naval base at Esquimalt Harbour, which at that point only consisted of three small huts. Dr. Campbell was sent ashore to establish a hospital in one of the huts. This would be the first hospital in the Colony. Most ailments were treated on board, however seamen suffering from long illnesses or serious injuries were brought to the shore hospital. Dr. Campbell remained there until the spring of 1859, when he once again took up his posting on the Plumper. Immediately upon rejoining his ship he was chosen to accompany Lieut. R.C. Mayne on a survey up the Fraser River and into the interior of the Province. On this trip they would cover approximately seven hundred miles in two months before rejoining their ship. When the survey was complete, Admiralty Chart 2067 “Vancouver Island – Harbours in Discovery Passage, Broughton Strait and Goletas Channel” was published in February 1863. The chart stated that the surveys were conducted by Captain G.H. Richards and the Officers of the H.M.S. Plumper in 1860. This chart is the earliest cartographic reference to a waterway on Vancouver Island named the Campbell River. Several other features in the region were also named after Dr. Campbell, including Campbell Bay and Campbell Point on Mayne Island, and Samuel Point adjacent to Mayne Island. In his life he would go on to be appointed to ships in the Caribbean, the Chilean Coast, China, and Korea, among other areas. In 1881 due to ill health he retired to County Donegal, spending his winters in the south of France. He died in 1910 and was buried a short distance from the farm on which he was born.